Many analysts seem to have missed the fact that the plunge in house prices has sharply reduced homeowners’ equity. According to data from the Federal Reserve Board, the ratio of homeowners’ equity to value at the end of the first quarter was just 38.0 percent at the end of the first quarter, the lowest on record. Prior to the run-up of the housing bubble, the ratio of equity to value had never been below 60 percent and it had been near 67 percent until the late 80s. 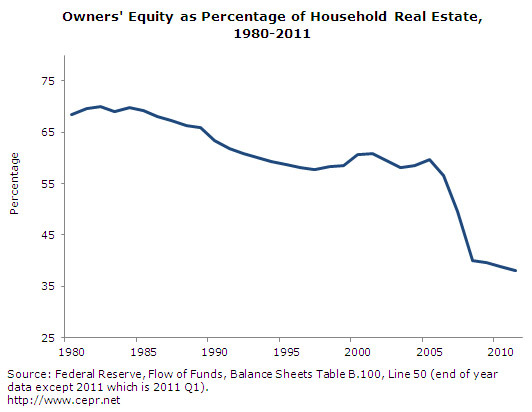 This massive loss in household wealth explains weaker consumption, not consumer pessimism.